Talis Putnins is a Professor in the Finance Discipline Group at UTS and a member of the Quantitative Finance Research Centre. 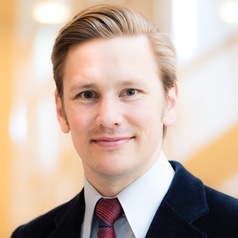 He has also held positions at the Stockholm School of Economics in Riga and the Baltic International Centre for Economic Policy Studies, and has been a Visiting Scholar at Columbia University and New York University. His main research interests include financial markets, market microstructure, market manipulation, insider trading and shadow economies. His research has been published in international peer-reviewed journals including the Journal of Financial Economics, Management Science, Journal of Financial and Quantitative Analysis, Journal of Financial Intermediation, Review of Finance, and Experimental Economics. Talis is the recipient of a Discovery Early Career Researcher Award (DECRA) from the Australian Research Council (ARC). Talis has done consulting and policy work for governments, stock exchanges, and financial institutions and served as an expert witness in legal cases.